Save time with more effective vacuuming. Dirt is much more easily released by vacuuming after your carpet and upholstery have been treated with Scotchgard Protection. Your home carpeting probably endures far less foot traffic than a carpet in a commercial environment, yet still it suffers from normal wear & tear. Offices, hotels and other public spaces see hundreds or thousands of feet a day, and require a far higher level of maintenance. At "A1 Carpet Clean", our professional team of commercial cleaners specializes in large areas and can assure you a well maintained carpet and cleaner working environment. Clean up Stains in a Flash! 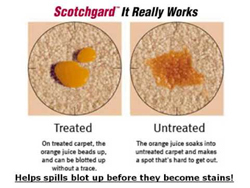 Stains are removed far more easily because Scotchgard repels liquids. Spills can be blotted up in the blink of an eye! 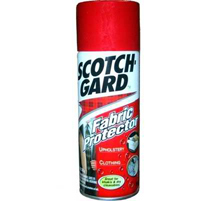 The best time to apply Scotchgard Protection is immediately after a professional clean from "A1 Carpet Clean" Experts. Such an application will keep your carpet, rug or upholstery clean and safe for a much longer period. Once our technician applies Scotchgard Protection, your carpet and upholstery will become easier to vacuum, as well as stain-resistant, making your home look cleaner and fresher for a long time.